Randolph College announced its formal partnership with Endstation Theatre Company in 2015. This Friday, that partnership will bear fruit in one of many ways as Endstation brings The Whole Bunch to campus. 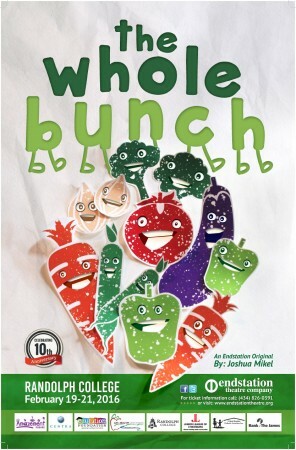 The Whole Bunch by Joshua Mikel, in collaboration with Rachel Gagen of Live Healthy Lynchburg, is an Endstation community-centered new work with the goal of educating Lynchburg citizens—especially elementary school children—about nutrition. The play is the first Endstation production to be performed at Randolph since the partnership was announced last June. Walter Kmiec, Jr., director of the play and Endstation’s artistic director, said The Whole Bunch uses humor to show how healthy or unhealthy eating habits can directly affect quality of life. The audience-engaging play teaches children and adults alike where to find fresh produce and other healthy foods in the Lynchburg area, which is designated as a food desert. The play’s six actors alternate roles as different talking fruits and vegetables, including Betty Broccoli and Gary Garlic. One of actor Alex Miller’s characters is Sarsaparilla Sam, a cowboy who serves as a narrator for the play. Along with the opening shows at Randolph, he is most excited about taking the play to local elementary schools later this month. “We’re going to be reaching hundreds of kids with live, locally produced art, many of whom would probably never have darkened the door of a theatre otherwise,” Miller said. Though The Whole Bunch has been prepared primarily for younger audiences, Kmiec believes Randolph students will also get their fill of entertainment. In addition to bringing productions like The Whole Bunch to Randolph, the partnership between the College and Endstation Theatre Company allows Endstation to use the campus as the home base for its summer program. In addition, it provides students apprenticeship opportunities, workshops, and access to Endstation’s specialized designers, technicians, and artists. This summer, the slate of Endstation performances continues at Randolph with Much Ado About Nothing, to be performed in Michels Plaza, and Hank Williams: Lost Highway in Thoresen Theatre. The Whole Bunch will be performed in Thoresen Theatre Feb. 19 and 20 at 7 p.m. and Feb. 20 and 21 at 2 p.m. Ticket prices are $5 for children and $10 for adults. To purchase tickets, call the Endstation box office at 434-826-0391 or visit www.endstationtheatre.org.